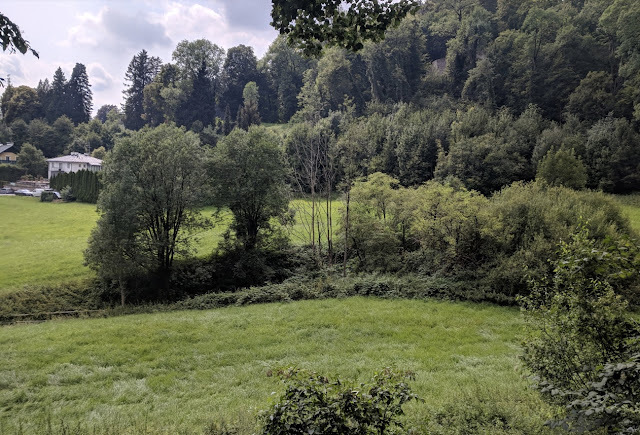 SearchResearch Challenge (7/25/18): The Mystery of the Salzburg Stream--does it flow uphill? It's just as lovely as you might imagine--the Alps surround a large river valley, it's endlessly green, and the Altstadt ("old town") is full of medieval streets, lined with churches and shops that have been around for hundreds of years. And yes, the hills are alive with the sound of music--at least I went to enough concerts to convince me of this. 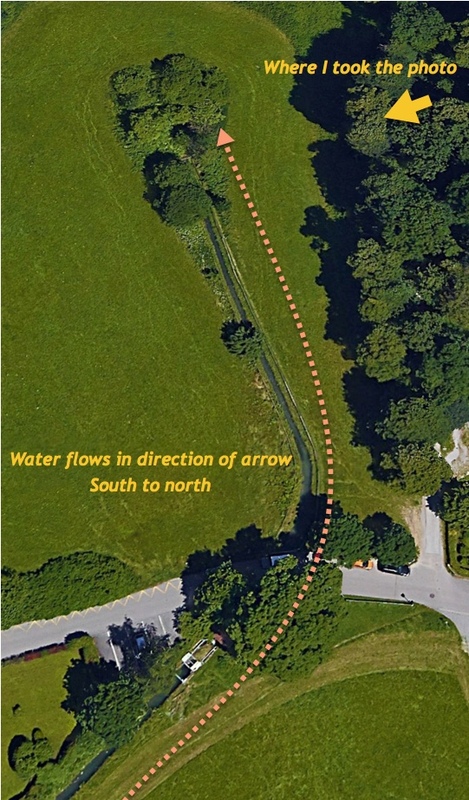 The surrounding area has a web of bike/foot paths and streams that seem to run every possible way. They're lovely, but it's a little confusing when you first arrive, although you learn the paths quickly. That's when you start to notice the little things--the things that make you say "What?" My first big surprise (after I got to know the place a bit) was the peculiar behavior of a stream that I passed often on my walks. As I walked to the foot of a pathway that climbed up to the castle wall, I had to pass over a small stream. It was a beautifully flowing stream, just about the platonic ideal of a stream. One time while I walked this path I paused for a moment, looking down at the water and noticed that it was flowing from south to north. That was so unexpected that I dropped a leaf into the water to verify that what I thought I was seeing was actually what was happening. Why was it so unexpected? It looks like the water is flowing uphill! What? The little bridge I was standing on is clearly downhill from the where the stream starts. It looks for all the world like the stream is running up the hill towards the castle! 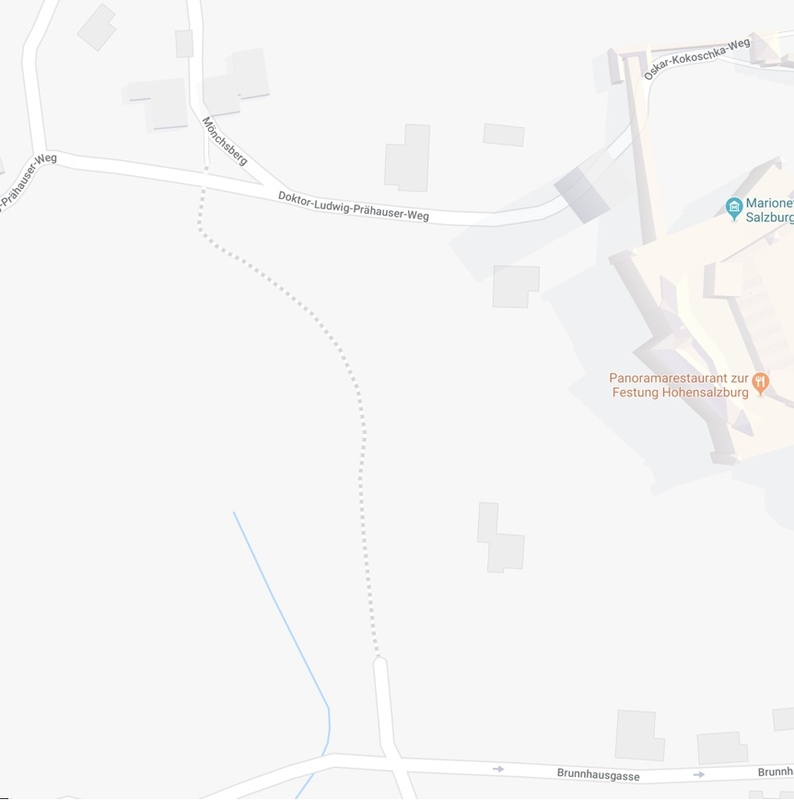 Here's the place (from Google Maps, in 3D mode). In reality, it's clear that the left part of the picture is uphill from the right part. 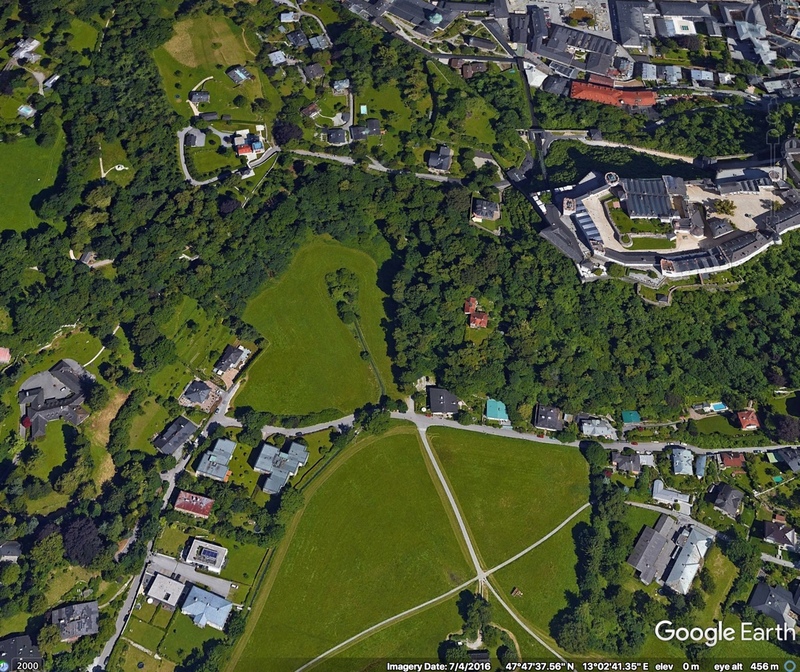 The white building at the top of the image is the old city castle, the Festung Hohensalzburg (that is, the "high Salzburg fortress"). 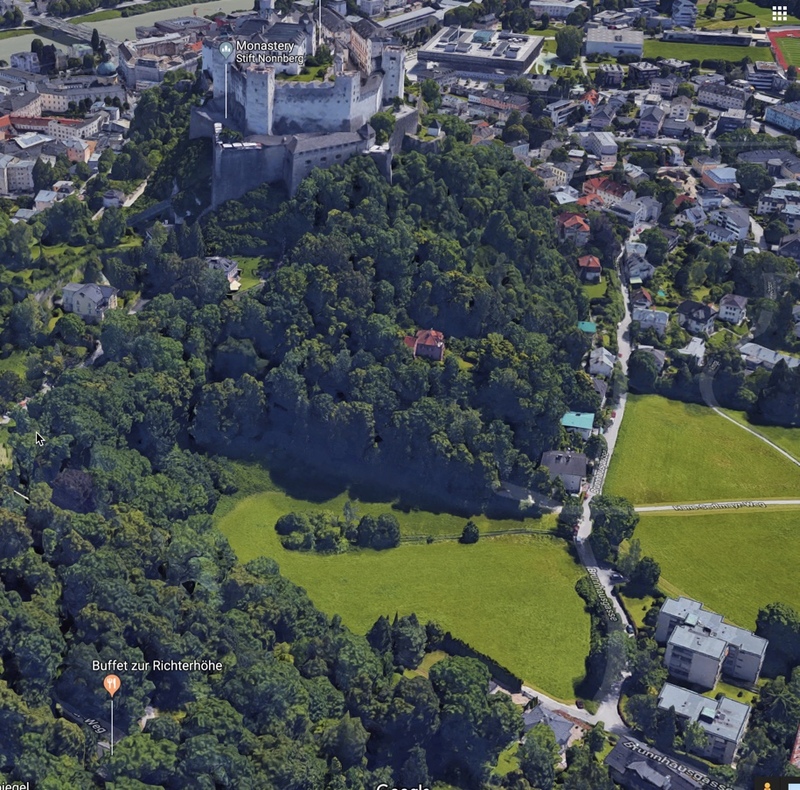 It sits atop the Festungsberg, a hill that rises up over the historic center of town. Just below the fortress is a patch of forest, and below that is a meadow. In the middle of the meadow is a stream that ends in a clump of trees and brush. Here's the map of that place. See the blue line of the stream? That dotted line is the pathway where I'd walk into the Altstadt. This all makes sense--it follows exactly parallel to the path, and you can see the little bridge on Brunnhausgasse where I crossed it. The map suggests that this is the spring source. 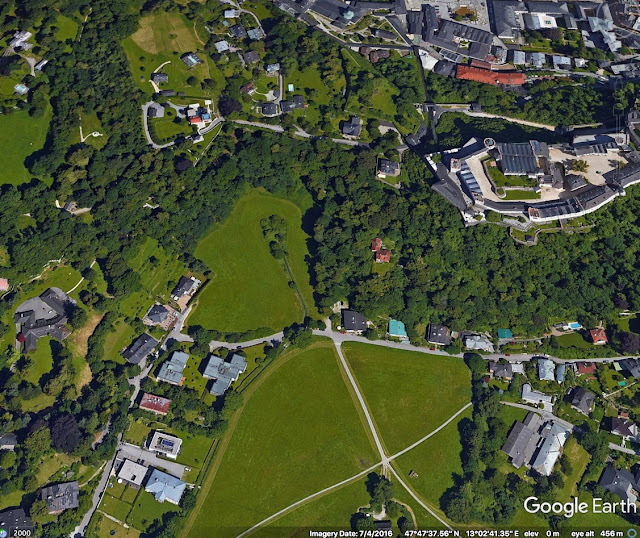 Here's the same scene in the satellite view. It sure looks like the source of a spring. As I walked past, I took a quick photo, just so I'd remember this for SRS. But... as you see in this map, the water is flowing from south to north! How is that possible? The slope of the hill is increasing from south to north. This leads me to this week's SearchResearch Challenge. How is it that this stream in Salzburg is apparently flowing uphill? What's the real story behind this gentling flowing brook? How is this possible? Hope you enjoy this Challenge! IF you want to get these SearchResearch posts by email (rather than by checking in every few days), here's how to do this. Hope many more of you join the email group! Answer: How do you plot out data by region? The case of regional boundaries. SearchResearch Challenge (6/11/18): How do you plot out data by region? The case of regional boundaries. It's time for a Challenging Challenge! The Setup: If you read the news these days you'll see all kinds of claims about various kinds of data. In an earlier SRS post we talked about immigration rates, and found that the data is a bit complicated, but you can figure it out. .. by COUNTY (not MSA or CSA). There are many ways to draw regional boundaries that make some kind of sense. For instance, gerrymandering is the practice of drawing political boundaries to give a particular party more (or less) voting power. There are commercial regional boundaries (such as the "Designated Market Areas," aka DMAs, define by the polling / survey company Nielsen). These regions correspond to media markets. For instance, the San Francisco-Oakland-Hayward Metropolitan Statistical Area (with a population of 4.5 million) and the larger San Jose-San Francisco-Oakland Combined Statistical Area (8.4 million) are both near where I live in Silicon Valley. I'm telling you all of this background because it leads to today's Challenge. A. Find a source of recent data that's organized by MSAs. 2017 would be best, but you should look for the most recent data. B. Find a visualization application that can ingest both the median income data and the shape of the MSA. 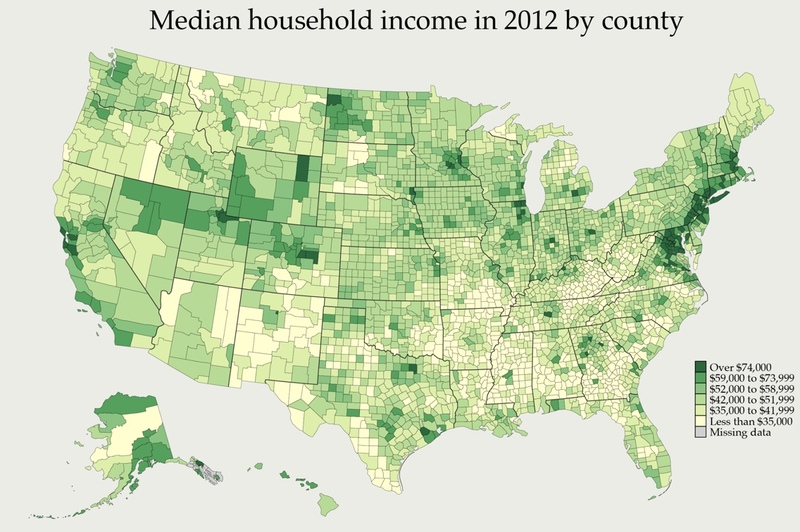 C. Figure out a way to create a visualization of the US MSAs that color-codes the income. It should look a bit like the above example, except with the income level determining the color of the MSA region. And, if you really don't like MSAs as the boundaries of map regions... find a different one, and tell us why you like yours better. Once you figure out how to do this, you'll have the means to do your own analysis, looking at data in your own way. P.S. This is the kind of thing that Data Scientists do all the time. With this Challenge, I'm hoping to instill some of the skills and values that Data Scientists bring to the job every day. Hope you have fun with it. I'm looking forward to your comments! Answer: How big was the range of these animals?